The Model 058 is a derivative of the Model 053 Ultrasound Prostate Training Phantom. The Model 058 is durable and appropriate for repetitive demonstration scanning. The prostate along with structures simulating the rectal wall, seminal vesicles and urethra is contained within an 11.5 cm X 7.0 cm X 9.5 cm clear container. A needle is embedded within the prostate to demonstrate needle localization. The phantom also contains a simulated lesion and calcification cluster. This phantom is an ideal demonstration device for rectal scanning. The Model 058 is a derivative of the Model 053 Ultrasound Prostate Training Phantom. The Model 058 is durable and appropriate for repetitive demonstration scanning. 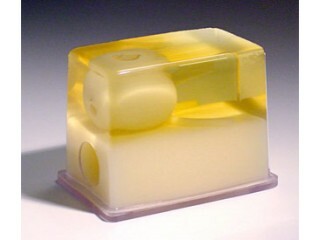 The prostate along with structures simulating the rectal wall, seminal vesicles and urethra is contained within an 11.5 cm X 7.0 cm X 9.5 cm clear container. A needle is embedded within the prostate to demonstrate needle localization. The phantom also contains a simulated lesion and calcification cluster. This phantom is an ideal demonstration device for rectal scanning. The Model 059 accurately mimics the ultrasonic characteristics of tissues found in an average human breast. The size and shape of the phantom simulates that of an average patient in the supine position. The Model 053A-EF Prostate Biopsy Phantom is a disposable phantom developed for practicing biopsyprocedures which involve scanning the prostate with an end-fire rectal transducer. The Model 066 Prostate Elastography Phantom is a disposable phantom developed for demonstrating procedures which involve the exciting new modality of sonoelastography. The Model 053-I Ultrasound Prostate Training Phantom is a disposable phantom developed for practicing permanent seed implantation procedures. It contains several unique features to assist the teaching and learning process.